Do you know how certain coins acquire their market value and what is the specific factor that certifies their authenticity? Graded coins are highly appealing to both collectors and investors because their grading serves (such as NGC or PCGS) as a guarantee of their value and authenticity. The grading process determines the physical condition of the coin – the so-called “state of preservation”. Coin grading became a usual practice in the United States beginning in the mid 19th century when the US Mint issued the first collectible coins. The coin’s grade is the key factor which determines the value of the coin. This grade is a sum of aspects, sometimes subjective ones, which place the coin in a certain category. This authentication process is performed solely by specific authorities who have strong knowledge in appraising gold coins and silver coins – the coin grading companies. In the US, there are three main tiers for the coin grading companies based on their reputation and reliability. All grading companies, except NGC, PCGS, and ANACS, are in the lowest tier of grading services because of their reputation that is built on inconsistencies in rating coins. For this reason, these companies charge a lower premium than the three exceptions mentioned above. America’s Oldest Coin Authentication and Grading Service (ANACS) is the middle-tiered grading company, the oldest on the market (as the title says), with grading regarded as acceptable. The top-notch grading businesses with the highest and most trusted rates are the Numismatic Guaranty Corporation (NGC) and Professional Coin Grading Service (PCGS). 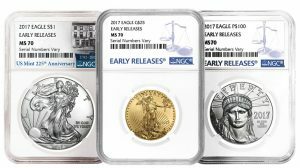 But what’s the difference between NGC and PCGS?! Both NGC and PCGS have an impeccable reputation, which makes the coins graded by them highly valuable on the market. These companies use the Sheldon scale, according to which, the coins get a grade from “1” to “70”. Both companies adopted this coin grading scale since their establishment (1986 and 1987 accordingly). NGC and PCGS also offer free access to their online databases of certified coins and an online coin grading guide for self-assessing the coin’s grades. The condition, value and the urgency for processing the request determine the coins’ premiums. Over the last decades, NGC and PCGS became worldwide leaders in grading coins, especially the Chinese bullion coins. However, in spite of their similarities, there are still differences between these two coin grading services. NGC is keener in sharing detailed information about their grading process. They show that each coin is separately authenticated and graded by two experts, and, in case these two won’t agree on the coin’s grade, a third coin expert steps in. Besides, NGC is the coin grading service of the Professional Numismatics Guild and the American Numismatic Association. However, feel confident that any of the two top grading companies is definitely worth your choice. Grading coins – is it worth it? NGC coins or PCGS coins? Certainly Yes! Why? Because NGC and PCGS designations certify and assure a higher numismatic value to your bullion coin. Graded coins become a guaranteed product and acquire the reputation of the grading company. 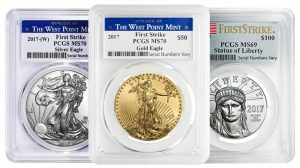 Are “First Strike” coins really the very 1st coins? The US Mint, just like most mints, do not issue first strike coins. It’s very hard to keep track of the exact order of manufactured coins during their striking. The “First Strike” designation (PCGS) certifies that the coins arrived for grading within the first 30 days of issue from the mint. NGC also used to apply the “First Strike” label, but it changed to “Early Releases”. Are first strike coins worth more? This designation is highly regarded among enthusiastic collectors. The label obviously adds a higher premium to coin’s initial market price. However, there is no proof that the “First Strike” or “Early Releases” coins will keep their value in time.